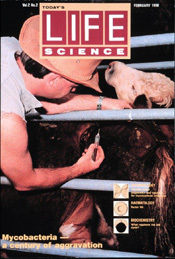 In 1985 a team of scientists came together within CSIRO Animal Health with the aim of developing a rapid (within 24 hours) test for tuberculosis (TB) in cattle to assist the eradication of the disease from the Australia’s cattle population. By 1990, a prototype test measuring cellular immune responses in whole blood had been developed and field testing showed it was more accurate than the incumbent and 100 years old skin test. The test could be completed within 24 hours using standard laboratory equipment. This work was recognised by the award of a CSIRO Medal for Research Achievement in 1990. CSL licensed the technology and commercialised and marketed products globally for TB diagnosis in cattle (Bovigam®), deer (Cervigam®) and primates (Primagam®). A human test (QuantiFERON-TB®) was also developed by CSL but was sold in 2000 to an Australian start-up Biotechnology company Cellestis Limited, which now markets the improved QuantiFERON®-TB Gold and QuantiFERON®-TB Gold In-tube products around the world. This story has its origins in 1984 when CSIRO was invited by the Australian Meat and Livestock Research and Development Corporation (AMLRDC) to put forward a research proposal to improve the diagnosis of TB in cattle. This challenge was taken up by Phil Plackett and Leigh Corner who proposed a program involving antigen characterisation and basic studies looking at the immune response to TB infection. AMRLDC funded the proposal and Paul Wood was recruited from Melbourne University in 1985 to work on the cellular immune response to TB in cattle. It was clear from early on that the main requirement of the people who were conducting the TB eradication campaign was a rapid test for both active and latent TB infection which could replace the current 3-day in vivo skin test. In 1986, the National Brucellosis and Tuberculosis Eradication Campaign (BTEC) agreed to provide additional support for the CSIRO group and Tony Radford (Molecular Biologist), Theodora Fifis (Protein Chemist) and Jim Rothel, an experienced CSIRO scientist, plus several other technical staff were recruited to join the team. The TB group now consisted of 12 staff from a broad range of technical disciplines. With the identified constraint that the test needed to be rapid (within 24 hours) the new team started to look at the various cytokines released by immune T cells when they recognise antigens. Paul Wood had previously worked on gamma interferon (IFN-Î³) in mouse models so the team set about developing a bioassay for bovine IFN-Î³. Using isolated lymphocytes from cattle experimentally infected with bovine TB, they established that by incubating the cells with TB antigens they could detect the specific release of IFN-Î³ within 24 hours, an in vitro antigen specific cellular immune response. This new diagnostic assay system was then shown to work with lymphocytes from naturally infected cattle. While these were promising results, lymphocyte isolation was a laborious process unsuited to a routine diagnostic assay. The solution was simple, but not obvious, and came from Leigh Corner asking why we could not just use whole blood for the in vitro incubation step. This had not been done before as current opinion was that an assay using whole blood samples would be too insensitive. In the end, after some modification, the whole blood incubation system was shown to be at least as sensitive as other assay systems measuring cellular responses. The next step was to replace the time consuming bio-assay with a rapid immunoassay using monoclonal antibodies to detect the presence of bovine IFN-Î³. An agreement was reached with Ciba Geigy to supply recombinant bovine IFN-Î³ and with the help of Peter McWaters (CSIRO scientist in another group) suitable monoclonal antibodies were produced. At the same time, it was obvious a commercial partner was needed to commercialise the now patented technology. Support was found from Hugh Middleton, Head of CSL Animal Health, who championed the idea within CSL. The time was right for CSL, which had just started a diagnostic products development group within R&D led by John Cox. After signing exclusive licensing agreements, CSL R&D scientist Stephen Jones was given the task of developing a sensitive and specific immunoassay that could be used as a field test. A key meeting was set up with the national BTEC committee to consider the results available at the time and decide the next steps. The Australian TB eradication campaign was in its later stages and most known TB infected herds were being destocked to meet the aggressive timeline set for eradication. To the credit of the cattle industry, it agreed to fund a large-scale trial of this new technology and provided $1 million to fund this work. The support of the various State Departments of Agriculture to identify possible herds to test and participate in the trial is acknowledged. In total, approx. 13 000 cattle and buffalo were tested across the country in clinical studies directed by the CSIRO/CSL team. Independent analysis by Chris Baldock showed the IFN-Î³ assay (now known as Bovigam®) was significantly more sensitive than the tuberculin skin test in the detection of TB infected cattle. While the results of the extensive field trial in Australia were very encouraging, to gain international recognition for this new technology it was necessary to assist with multiple trials around the world. Over the next decade major studies were conducted in New Zealand, Ireland, Northern Ireland, England, Spain, Italy, the USA and Argentina. This effort was shared between the CSIRO group and CSL and involved technical training, assistance with trial protocol, speaking at various meetings, data analysis and lobbying of government agencies. Ralph Slaughter took over the marketing of this new product at CSL and became a tremendous advocate for Bovigam®, developing markets in over 25 countries. CSL also used the technology to develop diagnostic kits for deer (Cervigam®) and primates (Primagam®). Internationally, other scientists developed the assay system for some more exotic species, such as camels, lions and elephants. The research work for the CSIRO Animal Health group was largely completed in the early 1990s and the group moved onto the next phase of their careers; Tony Radford to the Australian Biotech company AMRAD, Jim Rothel to do a PhD and Paul Wood became the Dept-Director of the CRC for Vaccine Technology. Meanwhile, the possibility of developing the technology into a test for human TB was raised within CSL. The CSIRO-CSL agreement was extended to include human applications and CSL, with Stephen Jones heading the team, set out a program to develop what was later branded QuantiFERON®-TB. CSL Diagnostics, under the leadership of Paul Bordonaro and Peter Bradley, continued the development and commercialisation of QuantiFERON®-TB during the mid to late 1990s. Dr Jonathan Streeton, Consultant Respiratory Physician in Melbourne, played a central role in the early years of clinical development of QuantiFERON®-TB. In 1996, CSL decided to embark on a program to gain US FDA approval of QuantiFERON®-TB and Jim Rothel, after finishing his PhD, was recruited to lead the new team formed to achieve US registration. This meant working closely with TB researchers at the US Centers for Disease Control and Prevention. The FDA application for US market approval of QuantiFERON®-TB was submitted in February, 2000. The decision by CSL in late 2000 to divest the QuantiFERON®-TB technology caused some concern but also created an opportunity. Jim Rothel and Tony Radford, having recently left AMRAD, decided to join forces to start a new company, Cellestis, which with independent financial support licensed the technology from CSL in December, 2000. Cellestis floated on the ASX in April, 2001. Since then, Cellestis has significantly improved the QuantiFERON®-TB technology through the licensing of TB specific antigens from Staten Serum Institute in Denmark and has gained two further FDA approvals for QuantiFERON®-TB Gold and QuantiFERON®-TB Gold In-tube. Cellestis Limited now sells the QuantiFERON®-TB test world-wide, and it is the reference standard in many countries. The company has offices in Australia, the USA, Europe and Japan, employees approximately 50 people, and has reported global annual revenues of > $20m for 2007-08. The animal health products (Bovigam®, Cervigam® and Primagam®) are being marketed by Prionics AG, Switzerland, and are increasingly playing important roles in controlling the spread of bovine TB worldwide. The important contribution of this technology to human and animal health is further highlighted by robust scientific literature, with over 500 publications to date. Wood PR, 2009, Personal communication.